"With God on our Side"
On April 10, 1953, bag Hammarskjold became Secretary General of the United Nations when he took the following oath of office: "I, Dag Hammarskjold solemnly swear to exercise in all loyalty, discretion and conscience the functions entrusted to me as Secretary General of the United Nations, to discharge these functions and regulate my conduct with the interests of the United Nations only in view and not to seek or accept instructions in regards to the performance of my duties from any government or other authority external to the organization" (Lash.297). Thus he became the chief administrator of the United Nations and the chief overseer of its various agencies. The Security Council had the authority to give him tasks to perform. He could also decide what pressing world problems needed, the immediate attention of the Security Council. He brought patience, probity, independence, impartiality and great skills as a listener, negotiator and mover to the job. He also brought great moral integrity and intellectual and physical energy with him. His writings in Markings show him to be very religious, serious, and high-minded; a lover of God, man and nature and one full of faith and obedience. As he wrote, `Do what you can, and the task will rest lightly in your hand . . .in the presence of God, nothing stands between Him and us, we are forgiven. . let all that is in me serve Thee" (Hammarskjold.124). Dag Hammarskjold was descended from a long line of nobility. His father Hjalmar was civil servant to King Gustav of Sweden. His mother was Agnes Almquist, a friendly, human, warm and exuberantly sweet woman. Dag was born on July 29, 1905. He attended the gymnasium (high school) and the University at Uppsala. His academic career was very distinguished, earning him degrees in law, economics, and humanities. Gunnar Myrdal examined him for his doctoral degree in economics in 1933. Ernst Wigforss, a Swedish Economist said of Dag, `To a much greater degree than his father, Dag had a talent for winning people personally, straightening out differences and filling a leading role in big organizations" (Lash.31). In 1931 he was appointed to his first civil service job in Sweden--that of Secretary of the Royal Commission on Unemployment. Sweden declared her neutrality in the Second World War. During that period, Hammarskjold ran the Swedish Price Control Board. He became Chairman of the Riksbank and at the end of World War II he and Wigforss converted Sweden to peacetime economy. In 1946 he negotiated the Swedish-U.S. trade agreement and was the Swedish representative on the Organization for European Economic Cooperation and the Marshall Plan. Because Sweden possessed no colonial empire and was not a belligerent in World War II, Dag had no ax to grind. He represented no special interest and thus played a uniquely impartial role in negotiations. Since the defeat of the Swedish King, Charles XII by Peter the Great of Russia in 1710, Sweden gave up ambitions to become a great power. Sweden looked more and more homeward. She developed her people and resources in consonance with a peaceful nation. Her economy and social organization was of a country not preparing for war. Thus peace has been the status quo for the Swedish people for over two hundred years, and war mentality has passed from their memory. As a mature nation, Sweden puts her faith in the development of International Laws and Arbitration among nations for the settlement of disputes. Dag Hammarskjold said "With Charles XII's death, a conquest of the homeland had started in art and in science. . .the conquest in the world of intellectual culture, of a position which genius, courage and effort cannot alone create in the political world" (Lash.44). 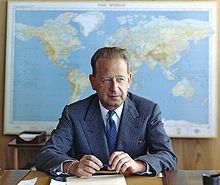 Being a product of Sweden's non-belligerent outlook, Dag Hammarskjold was well trained to take over the work of the UN Secretariat, as Wigforss declared "The respect which Hammarskjold acquired at OEEC for his acute intelligence, good judgment and ability to find ways out of bothersome situations was principally what made it possible to launch him as a candidate for the Secretary General" (Lash.41). 1953 was a time when McCarthyism was rampant in the United States. The Secretary General came under pressure from the U.S. Secretary of State, John Foster Dulles to allow some members of the U.N. Secretariat to be scrutinized by the Federal Bureau of Investigation. Hammarskjold resisted the encroachment of the F.B.I. He established a procedure whereby no anonymous testimony or evidence that cannot stand in a court of law could be used against employees of the U.N. Thus he was able to retain the independence and integrity of the organization. At the same time he established the groundwork for a truly international civil service, which was beyond the control of the great powers of any other power. The U.N. was to operate in a spirit of impartial universality. President Eisenhower proposed "Atoms for Peace" to be sponsored by the U.N.. An international gathering of scientists assembled in Geneva in 1954 under the chairmanship of Homi H. Bhabha. This ushered in a period of detente among the members of the U.N. at the commencement of Hammarskjold stewardship. On December 10, 1954 the General Assembly instructed the Secretary General to seek the release of eleven American airmen shot down over China. Since the United States did not recognize the government of Communist China, it could not deal directly with the Chinese. Dag Hammarskjold decided to go to China in person to negotiate with them. At the end of the meetings the communique read "talks had been useful and questions, pertinent to relaxation of world tensions" (Lash.62) were discussed". However the airmen were not released until Hammarskjold 50th birthday on July 29, 1955. The journalist Edgar Snow reported that Chou En-lai told him that the eleven U.S. airmen were released because of the intercession of the Secretary General and the government of India. However the United States still opposed the admission of China to the U.N. The Suez Crisis broke in 1956, and Dag Hammarskjold took part in its resolution. The problem arose because the United States withdrew its financial support to Egypt to build the High Aswan Dam. President Nasser then nationalized the Suez Canal to enable Egypt to raise the funds herself. The Secretary General tried to get the parties, users and owners to peacefully settle the Suez Canal problem, but to no avail. The British, French and Israelis attacked Egypt on October 28, 1956. President Eisenhower ordered Dulles to go to the U.N. and stop the fighting. The British and French vetoed a cease-fire in the Security Council, but the General Assembly passed it by a 64-5 vote. The Secretary General proposed a military peace keeping force called the United Nations Emergency Force to the General Assembly and it was accepted by that body on November 4, 1956. The British and French troops withdrew on December 22, 1956, and the UNEF were in the Gaza Strip on March 7, 1.957. 6,000 troops from ten countries were to keep peace between Egypt and Israel. The conditions under which UNEF could be stationed in any country are as follows: 1) required the consent of the state in which the force is to be stationed; 2) provided that UNEF could not be used by one country to impose its will on another; 3) stipulated that the UNEF must fully respect the rights of members of the U.N., since the U.N. cannot accept the change of existing legal boundaries by military operation contrary to the charter of the United Nations (condensed from the U.N. Charter). Contemporaneous with the Suez Canal Crisis was the Hungarian Crisis. Hungarian students revolted against Soviet control of their country. The Hungarian uprising started on October 22, 1956 and continued on and off until about November 10, 1956. On October 24 the Hungarian government asked the Soviet Union to help restore order. On October 30, Imre Nagy stated that Soviet troops were withdrawing. On November 4, the U.S. claimed that lime Nagy desired a neutral Hungary and pushed forward such a resolution in the Security Council, a resolution vetoed by the U.S.S.R. To establish a neutral Hungary without Soviet approval would have meant another World War. As Lester Pearson of Canada put it, "The Assembly can act, not by compulsion, but by agreement." On November 4th, the same day that radio Budapest was wiring for U.N. help, another Hungarian regime, under Janos Kadar was telling the U.N. to cease and desist from interfering in the internal affairs of the sovereign member state of Hungary. Egypt had agreed to accept U.N. help and U.N. intervention worked there. One Hungarian regime first asked for help and then another regime immediately rescinded that request. The U.N. could not successfully operate under those conditions. My powerful state, e.g. the big five nations holding veto power, can also render U.N. action impotent. In the words of Hammarskjold, "Working at the edge of the development of the human society is to work on the brink of the unknown.. .Much of what is done will one day prove to have been of little avail. That is no excuse for the failure to act in accordance with our best understanding. . with faith in the ultimate result" (Lash. 292). The Lebanon problem next occupied the attention of the Secretary General, who tried without success to arrange a summit meeting in the U.N. in 1957 between Britain, the U.S.A. and the U.S.S.R. The pro-Western government of Lebanon asked the U.S. for aid when some of its Arab citizens started a rebellion and the U.S. sent in troops. The U.S.S.R. asked in the U.N. for the withdrawal of troops from the region. Dag Hammarskjold sent in an observation team, called the UNOGIL (United Nations Observation Group in Lebanon) consisting of representatives from Norway, Ecuador, and India to restore peace in the area. The Arab "Good Neighbor" resolution was passed in the U.N. in which the Arab states declared non-interference in each other's internal affairs. This was followed by the withdrawal of U.S. troops from Lebanon and Jordan, since there was assurance that the Arab League (consisting of Syria and Egypt) would not try to gobble up its smaller neighbors. Peace was thus restored in the Middle East. Many leaders of both super powers, the U.S A. and the U.S.S.R., regarded peaceful co-existence as appeasement, even though the Secretary General supported it in these words: `We are on dangerous ground if we believe that any individual, any nation, or any ideology has a monopoly on rightness, liberty and human dignity' (Lash. 149). The Secretary General believed that the U.N. was the rightful place where the nations should meet to negotiate and reconcile their disputes, not just score propaganda and debating victories. Hammarskjold held a news conference once every two weeks and opened the U.N. to news reporters, T.V. and radio programs, films, tapes and radio broadcasts in many languages. The world public was free to scrutinize their organization. The Secretary General also labored to keep the newly emerged third world countries from the tentacles of the cold war. The U.S. tended to back up the autocratic conservative right wing leaders who talked democracy but did not necessarily practice it. On the other hand, the U.S.S.R. usually supported the socialist or communist leaning groups. This "tug of war" brought the East-West ideological quarrels right onto the doorsteps of these poor countries at a time when establishing an efficient, incorrupt government, feeding theft people, restoring civil rights and maintaining law and order were more important than falling into the eastern or western camp. Whenever conflicts arose in these new countries the Secretary General tried to localize them to keep them out of the cold war east-west tussle and power contest. He was more interested in peace and prosperity for these poor nations than in their ideology and political leaning. He wanted them to obtain the respect and integrity, which the U.N. Charter guaranteed them. For these reasons he tried to support them with technical help from the various agencies of the U.N. which dealt with administration, agriculture, science, social work, transportation, labor, health and laws, etc. He firmly believed that the U.N. was the main protector of these third world countries from big power politics, indulgence in which could lead to civil war and their complete destruction. Dag Hammarskjold worked hard to halt the arms race. Indian Prime minister Jawaharlal Nehru suggested a ban on nuclear testing to the U.N. on April 2, 1954 after Japanese fishermen suffered from nuclear fall-out from hydrogen bomb testing in the Pacific Ocean in early 1954. Finally, on December 16th, 1955, the General Assembly passed a resolution against Nuclear bomb testing. At that time the prime minister again made another suggestion to appoint a scientific committee to study the effects of atomic radiation. In 1957 the Disarmament Committee of the U.N. proposed U.N. supervision of a halt to nuclear testing. The Big Powers dragged their feet and continued testing. In 1958 Linus Pauling presented a petition to the U.N. to halt the testing from over 9,000 scientists representing 43 countries of the world. The U.S.S.R. unilaterally stopped testing for a time. The U.N. Commission on Disarmament kept working at the problem. The U.N. soon learned that the U.S.A. and the U.S.S.R. ran the Arms Race and anything else pretty much as they pleased. The pleadings of other nations made little difference. The Two Big Powers did not care to relax their hegemony over their half of the world or halt their rivalry, their mastery of scientific and technological skills or their weapons stockpiling. The Secretary General did not give up. Concerning space he said "...the basic rule that outer space, and the celestial bodies therein, are not considered as capable of appropriation by any state...and that international machinery would be established reflecting the over-riding interest of the community of nations in the peaceful and beneficial use of outer space" (Lash. 154). As for the arms race, H2mmarskjold said, on hearing about the unilateral test ban of the U.S.S.R.; that it was, "a step which I welcome...I am all for the cessation of tests. I am all for the proper inspection of cessation of tests. I am all for the stopping of production...the arms race makes it impossible to look with equanimity upon the diplomatic game being conducted in which governments discuss and write letters and people are misled into assuming everything is all right. There is a point in the development when every time an initiative is taken in good faith and its possible consequences, possible values, are not fully explored, I have the feeling we have missed the bus. We should not be too sure that the road will remain open for buses all the time in the future" (Lash.154-156). During Dag Hammarskjold tenure of office the number of African states grew from 3 to 26. On a tour of Africa in early 1960 he saw great problems facing these countries, and he sensed that the Big Power political involvement would only exacerbate the situation. The Belgian Congo became a free independent country on June 30, 1960. Within a few days civil war broke out. It was a large country of nearly a million square miles, cut off by dense jungles into many separate entities with their own local tribes and kings. Communication was almost impossible among them, and there was lithe feeling of national unity. The former Belgian rulers were to stay on and help the new administration. They had an army of 25,000 men. Joseph Kasavubu was head of state, and Patrice Lumumba was his Prime Minister. The province of Katanga, which had important minerals and was the richest, seceded on July 11th under its local Chief Moishe Tshombe. The presence of Belgian troops in Katanga helped Tshombe defy the central government. Kasavubu and Lumumba asked for U.N. assistance and the Secretary General moved the Security Council to set up the United Nations Forces in the Congo (ONUC). 3,500 men from neighboring African states --Ghana, Ethiopia, Tunisia, and Morocco -- were assembled in Leopoldville under U.N. command by July 18, 1960. The government of Congo split apart with Kasavubu battling Lumumba, until Colonel Josheph Mobutu imposed a military dictatorship. Lumumba had succeeded in getting fifteen Soviet transport planes and he wanted the U.N. forces to follow his orders, which they would not. The U.N. forces remained strictly neutral amidst all the turmoil. King Kolongi of Bakwana also seceeded. Lumumba declared war on him in Kasai province. The U.N. Security Council reaffirmed the neutrality of the ONUC, called for the withdrawal of Belgian troops, and sent Rajeshwar Dayal as chief U.N. Officer in the Congo. On September 5, 1960, Kawabubu dismissed Lumumba who eventually sought U.N. protection. Concurrent with this crisis was the meeting of the heads of state at the U.N. September 10, 1960. There, Nikita Khrushchev demanded the ouster of Dag Hammarskjold and his replacement by a Troika, a three-person Secretary General of the U.N. The non-aligned leaders headed by Indian Prime Minister Nehru did not support this plan, and Dag Hammarskjold retained his position by a 83-11 vote in the General Assembly. The situation in the Congo progressed from bad to worse in 1961. Tshombe, Kalonji and Kasavubu formed a military alliance against Colonel Mobutu who had taken over the central government. The bloody civil war continued. Prime Minister Nehru supported the Secretary General and dispatched 5,000 Indian troops to help the U.N. try to maintain peace. The Prime Minister also influenced the non-aligned block of countries to vote for keeping the U.N. in the Congo. The record has shown that the U.N. did everything solely in the interest of the Congolese people. The Secretary General was in Leopoldville in September of 1961 but failed to get Tshombe to come for negotiation. He therefore decided to fly to Ndola in Northern Rhodesia to meet Tshombe face to face. His plane left on the night of September 17, 1961 and crashed a few miles from the Ndola airport killing him and his crew. So ended the life of the foremost civil servant of the world. His biographer Brian Urquhart paid him this tribute: `Dag Hammarskjold was that most unusual of creatures, a truly good man. He was a man involved in momentous issues which he came to symbolize, even in death...By his skill, stamina, and resourcefulness he made a new art of multinational diplomacy. He gave a fresh dimension to the task of international service by the qualities of his mind and of his compassionate nature. He was an outstanding proponent of the conviction that our fate is what we make it" (Urquhart. 596-597). Presiding at Hammarskjold funeral, Archbishop Erling Eidem said "Death forces us to face the old and always so disturbing question of the meaning and fulfillment of our life on earth. The answer may be expressed in one word -- serve -- so measurelessly simple, yet so overwhelmingly filled with significance" (Urquhart. 597). Dag Hammarskjold served to his last breath.